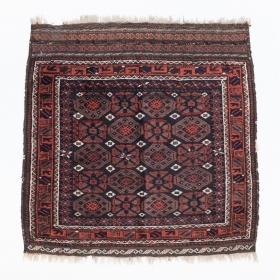 Sadegh Memarian, Spieringweg 835, 2142 ED, Cruquius, The Netherlands. 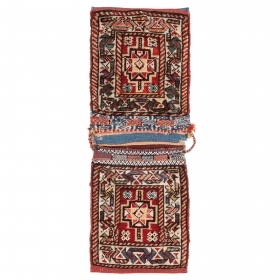 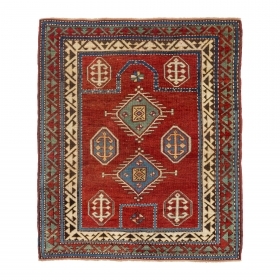 From 1990 I trade in old and antique tribal rugs and kelims. 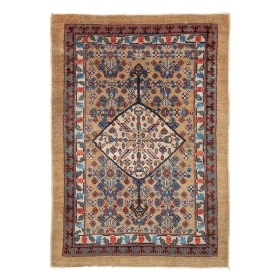 More can be seen on my website: (www.sadeghmemarian.com). 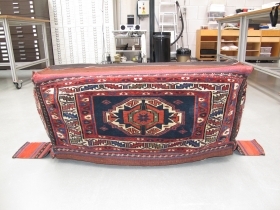 Moreover so do I trade in decorative and modern carpets and kelims (www.memarian.nl). 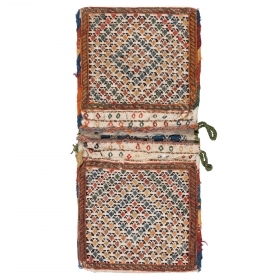 active since March, 22, 2009. 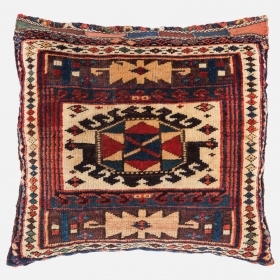 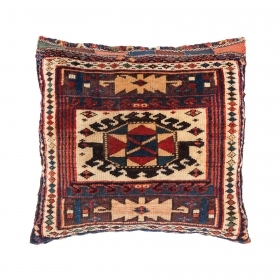 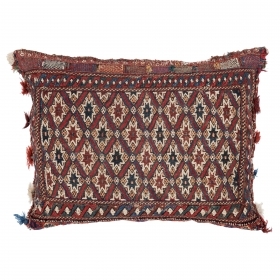 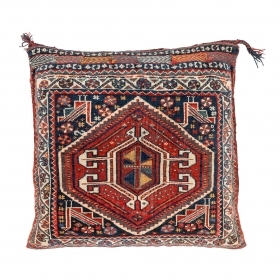 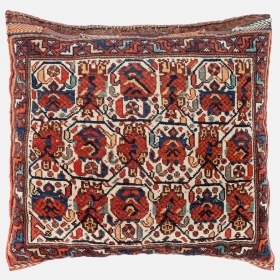 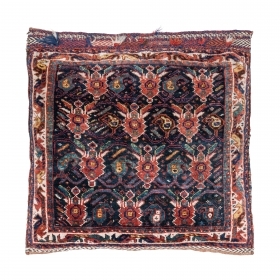 Qashqai Cushion, Late 19th century, Good condition with all natural colors, Not restored, Size: 60 x 60 cm. 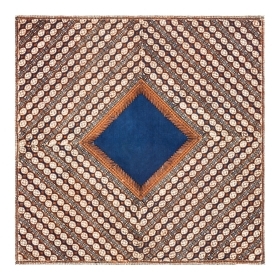 (24 x 24 inch). 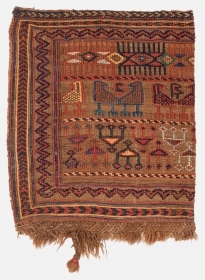 Wagireh-Sampler (Ornak) Meshed-Saber?, North East Iran, Early 20th century, Original condition, Not restored, Size: 90 x 52 cm. 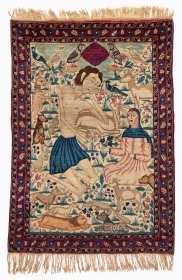 (35.5 x 20.5 inch). 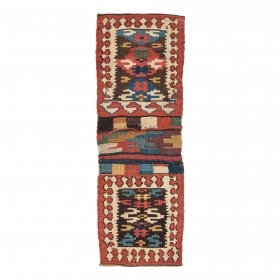 Kurdish rug, Late 19th century, Excellent condition, High pile, All natural colours, Size: 270 x 105 cm. 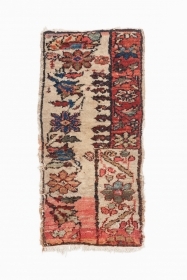 (106 x 41 inch). 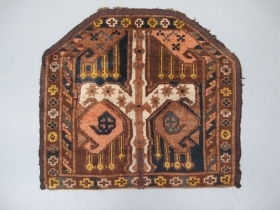 a few (6 pieces) Turkmen-Yomud fragments, Size: 14 x 18 cm. 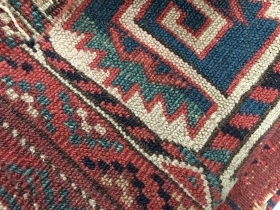 - 54 x 160 cm. 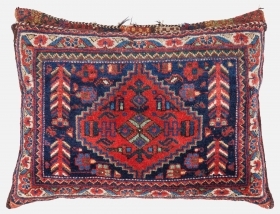 Shahsavan Saddle-bag, Late 19th century, Top condition, All natural colours, Not restored, link Size: 68 x 23 cm. 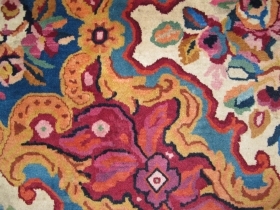 (27 x 9 inch). 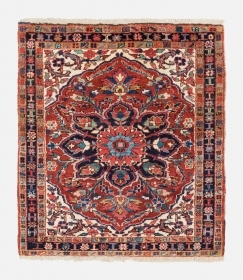 Round Esfahan? 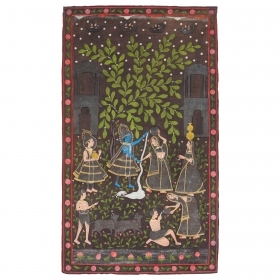 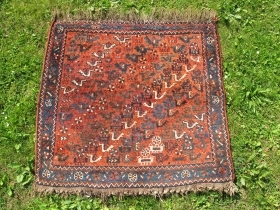 rug, 19th century, Excellent condition, All natural colors, Not restored, Size: 85 cm. (33.5 inch). 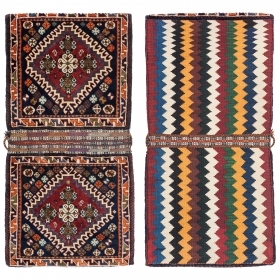 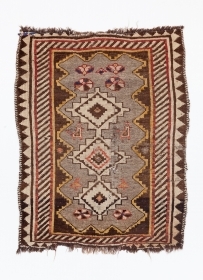 Tafresh Wagireh/sampler (Ornaak), Circa 1900, Good condition, All natural colours, Size: 46 x 22 cm. 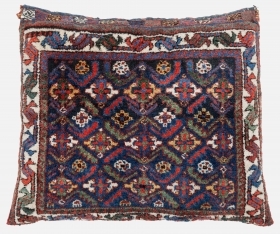 (18 x 8.5 inch). 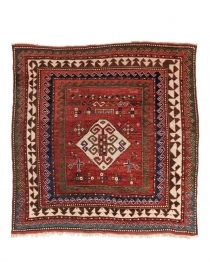 Baluch bagface, Circa 1900, All natural colours with silk, Not restored, Size: 83 x 81 cm (33.5 x 32 inch). 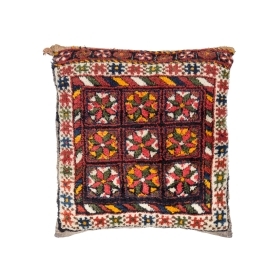 Small Luri Gabbeh, Early 20th century, All natural colours, Not restored, Size: 75 x 58 cm. 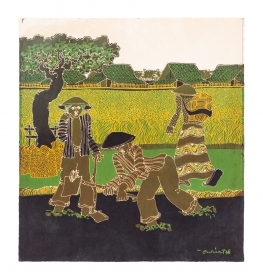 (29.5 x 23 inch). 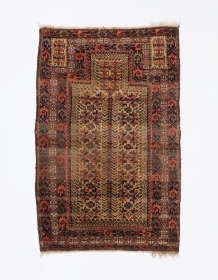 Decorative kilim from Morocco, Early 20th century, Great condition, Not restored, Size: 370 x 150 cm. 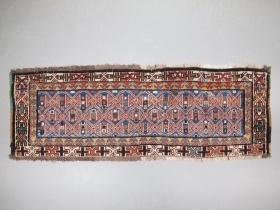 (145 x 59 inch). 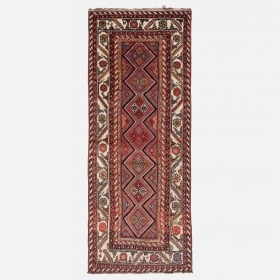 Baluch prayer rug, Late 19th century, All natural colours with silk, Not restored, Size: 157 x 100 cm. 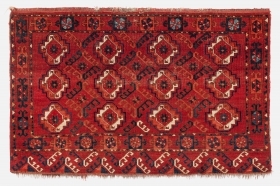 (62 x 39 inch). 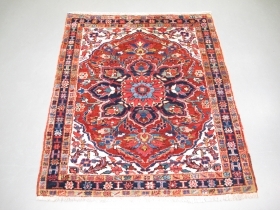 nw Persia, Circa 1900, Great colors, Not restored, Condition (see pictures), Size: 270 x 155 cm. 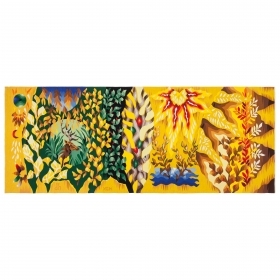 (106 x 61 inch). 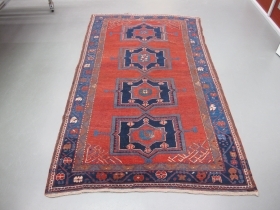 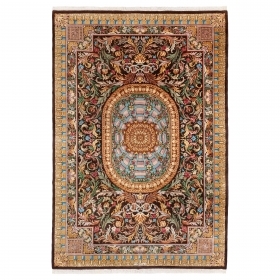 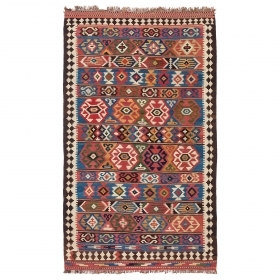 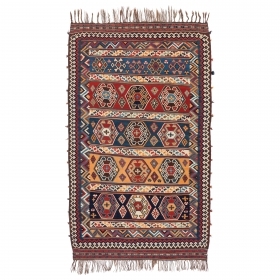 Small Heriz, Circa 1900, Great condition, High pile, All natural colors, Size 125 x 115 cm. (49 x 45 inch). 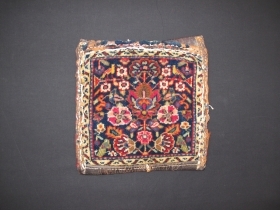 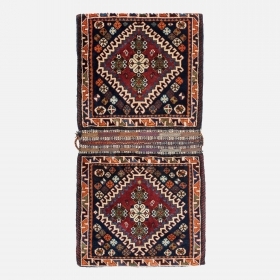 Afshar bag, Circa 1900, Excellent condition, All natural colours, Not restored, Size: 45 x 39 cm. 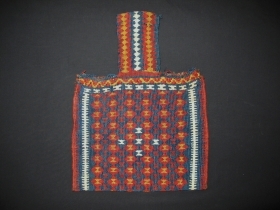 (18 x 15 inch). 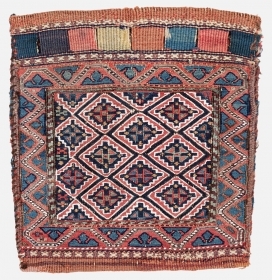 Shahsavan Chanteh, Sumak technic, Late 19th century, All natural colours, 31 x 31 cm. 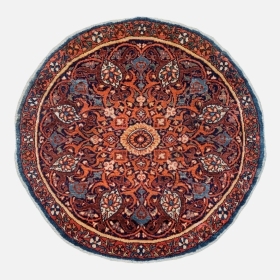 (12 x 12 inch).